Disc2day can make it easy for you to produce your own duplicated CD or DVDs. 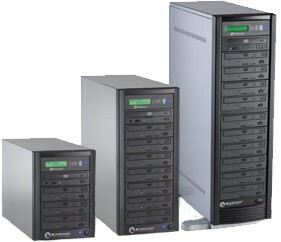 We stock stand alone disc duplication tower with 3 to 12 CD/DVD R/RW Drives and one reader drive. We have them with or without hard drives to store your master information. Duplicators are the most efficient way to get your CD duplication and DVD duplication completed to meet your deadlines. If you are a local musician or artists these are a great way to burn copies of your album fast before your show or event. They have significantly gone down in price recently which makes it the perfect time to purchase now. Call us today and ask for one of our friendly sales representatives to get a quote.